Abu Dhabi, UAE: 18 July 2017 – From Tuesday 11 July to Thursday 13 July 2017, the Abu Dhabi Global Environmental Data Initiative (AGEDI) hosted the second annual meeting of the International Partnership for Blue Carbon. Announced at COP21 in 2015 by the Government of Australia, the partnership is a consortium of governments, non-profit organisations, and intergovernmental agencies who equip policy-makers with actionable information and knowledge of coastal blue carbon ecosystems (mangrove, tidal marsh and seagrass) for climate change mitigation as well as securing social, economic and environmental outcomes. Improved management of these ecosystems can enhance food security, secure livelihoods, increase resilience and contribute to delivering Nationally Determined Contributions (NDCs) through carbon sequestration and adaptation. The partnership aims to protect and restore coastal blue carbon ecosystems by building awareness, sharing knowledge and accelerating practical action. 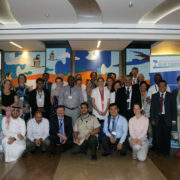 The second annual meeting involved policy and technical discussions from mitigation and adaptation perspectives. It took stock of the international state of play on blue carbon science, policy and on-ground activities, discussed advancements in international policy frameworks relevant to blue carbon and looked at innovative financing avenues available to implement activities more effectively. Attendees included members from international organisations, government representatives from Africa, Europe, America and Asia as well as participants from the private sector and NGOs. “Australia has one of the largest expanses of coastal wetlands in the world. We have a range of policies in place to conserve these ecosystems and the many migratory and threatened species they are home to. This year Australia has also reported on mangroves and tidal marshes in our National Greenhouse Gas Inventory as part of improved emissions reporting. It is important to work together to share our experiences in conserving these important ecosystems, such as through the Partnership,” said a spokesperson for the Australian Government Department of the Environment and Energy. Engineer Muna Omran Majed Al Shamsi, Acting Director, Biodiversity Department, Ministry of Climate Change and Environment, said: “In the UAE, we have been working extensively in marine resource conservation, sustainable fisheries, aquaculture and research and development. One particular area of focus has been the protection of our blue carbon ecosystems. We have been working hard with the Environmental Agency Abu Dhabi, and the Abu Dhabi Global Environmental Data Initiative (AGEDI) and relevant entities to assess the carbon reserves that these systems hold. These studies have helped us identify carbon stocks that are extremely valuable, and reinforce the importance of appropriate conservation measures to protect the blue carbon ecosystems. We know that, if destroyed, these ecosystems will release carbon into the atmosphere and contribute to global warming. For example, it takes four decades for newly planted mangroves to mature and sequester the same amount of carbon as mature mangrove forests. For more photos of the workshop click here! 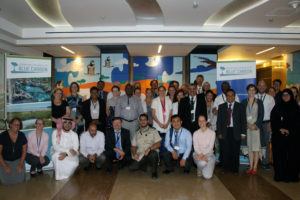 More information on blue carbon, the partnership, the meeting outcomes and future meetings can be found at www.bluecarbonpartnership.org. The Department of the Environment and Energy designs and implements the Australian Government’s policies and programmes to protect and conserve the environment, water and heritage and promote climate action. The environmental framework is being delivered under four pillars: Clean air, clean land, clean water and national heritage. The Department of the Environment and Energy, along with the Australian Government’s Department of Foreign Affairs and Trade, lead Australia’s involvement in the International Partnership for Blue Carbon, including as a member of the Coordinating Group and secretariat functions. The Ministry of Climate Change and Environment was established in February 2006 as the Ministry of Environment and Water. The ministry acquired its new name following the UAE Cabinet reshuffle in February 2016 and the subsequent integration of the climate change function. Under its redefined scope, the ministry has taken on a dual mandate. On the national level, the ministry aims to strengthen the UAE’s efforts in preserving the environment and promoting food diversity in accordance with the nation’s aspiration to emerge as a key benchmark for sustainable development. On the global level, the Ministry of Climate Change and Environment will join international stakeholders in combating climate change and profile the UAE’s path-breaking achievements in the sector at thought leadership platforms worldwide. For further details, please contact us: Media@moccae.gov.ae. AGEDI is pleased to share the latest video regarding how Abu Dhabi’s Intervention site supports the GEF Blue Forests Project. The Blue Forests Project http://www.gefblueforests.org/ aims to address these challenges through coordinated on-the-ground demonstrations where better coastal ecosystem management is achieved by harnessing the values associated with carbon and ecosystem services, addressing key knowledge gaps, and providing experience and tools for greater global application. This four year project is an initiative of the United Nations Environment Programme (UNEP), funded by the Global Environment Facility (GEF) and co-financed by project partners, and managed by GRID-Arendal. 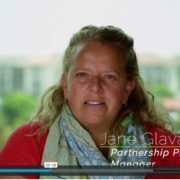 Jane Glavan from AGEDI shares her thoughts on Blue Forests Project from GRID-Arendal on Vimeo.